A couple of ducks swimming across a pond in Sydney Park, a large recreational area in the inner city suburb of Alexandria. The former brickworks here have been transformed into parkland with four cascading wetlands that attract birds. 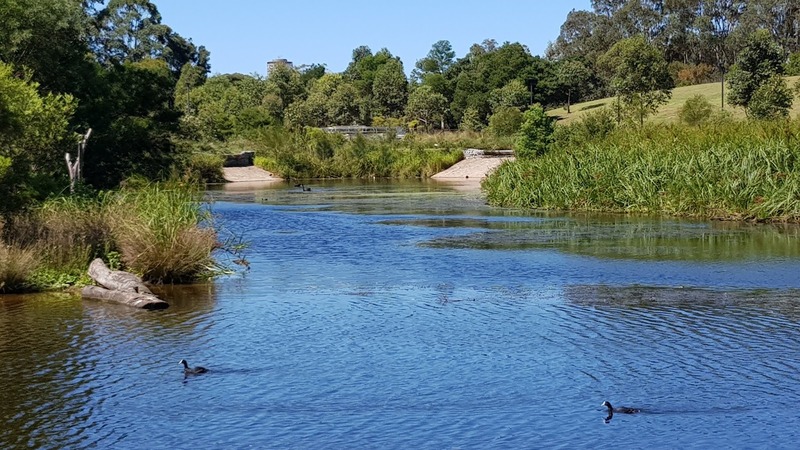 I have seen photos of so many dead fish in NSW, it is great to see a clean, flourishing water environment. A nice quiet looking place. Jim. Makes me think I would have liked taking a job offer at the Satalite Tracking Station a little farther south at Canberra. That would have been great, Jim. Ducks are always fun to watch, and water cascading is so refreshing to see and hear:) Many thanks for showing this place of serenity with All Seasons this week! Also your comments the last week on my weekly posts are very much appreciated! Have a lovely Spring week!